Steps for converting fractions to percentages. Enter the top number of the fraction to be converted into a percentage. Enter the bottom number of the fraction to be converted into a percentage. This is the entered fraction after reducing the fraction into simplest form. Note that the calculator will show its reduction work in a space below these result fields. If the numerator and denominator have no common factors other than 1, this field will simply display your original entry. This is the decimal equivalent of the entered fraction after it was reduced into simplest form. The calculator will display the long division you would use if you were to use the manual method of converting fractions into percentages. Note that if the result is a long decimal number and/or has repeating elements, the result can only be considered to be a close estimation. This is the percentage equivalent to decimal given in the previous field. The calculator arrives at this result by multiplying the decimal equivalent by 100 -- which is the same as moving the decimal point 2 places to the right. Note that the percentage result is rounded to two decimal points. This conversion calculator will reduce fractions into simplest form, convert the simplified fraction into a decimal number, and then into a percentage. Plus, unlike other online conversion calculators, this calculator will show its work. This includes the steps it took to reduce the fractions, as well as the long division you would use for converting fractions into percentages manually. If you are looking for a free online calculator for converting decimals into fractions, please visit the convert decimals to fractions calculator. Enter the numerator of the fraction you are converting. Enter the denominator of the fraction you are converting. Click the "Convert Fraction to Percent" button. This will display the simplified fraction, the result of the conversion, and generate a step-by-step explanation showing how the calculator arrived at the result. The greatest common factor (A.K.A: GCF, Greatest Common Divisor, GCD) is the largest number that will go into two or more different numbers evenly. Finding the GCF is most often used for simplifying fractions. For example, to reduce the fraction 1000/20000 into simplest form, you would divide the top and bottom of the fraction by their greatest common factor, which is 1000 (1000 goes into both 1000 and 20000 evenly). The result would be 1/20 -- which is much easier to work with than 1000/2000. How to convert a fraction into a percent. 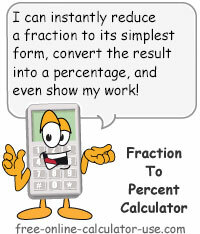 The steps for converting fractions to percentages vary depending on whether you are using a hand-held calculator or you are doing the conversion manually. If you are using a hand-held calculator, you simply divide the top number of the fraction by the bottom number of the fraction to get the decimal equivalent, and then multiply that result by 100. For example, if you wish to convert 9/12 into a percentage, you would plug 9 ÷ 12 into the calculator, which would give the quotient 0.75. If you then multiply 0.75 by 100, the result would be equal to 75%. On the other hand, if you are doing the conversion manually on a piece of paper or on a worksheet, you can save time by first reducing the fraction into simplest form. Continue adding zeros until remainder is zero, or until the desired number of decimal places is reached, then simply move the decimal point 2 places to the right to convert the decimal to a percentage. Note that the red vertical line indicates where the decimal point will initially be inserted, whereas the blue vertical line indicates where you will move the decimal point to in order to complete the fraction to percent conversion. So after simplifying 9/12 to 3/4, and then using long division on the simplified fraction, we can see that the fraction 9/12 converts to 75%.